Tell me something more exhilarating than growing from seed. I’ll bet you can’t. Drop a hard little fleck onto a fertile bed of damp compost, and just days later feel a gasp in your throat when the seed leaves push their shoulders up into the light. At the moment I’m looking at the purple-streaked leaves of baby baby beets, hairlike shoots of spring onions and round carrots, the fleshy heads of robust wild lupines, and the minute green specks of teensy alpine strawberries. A number of the experts on some of the US gardening podcasts I listen to have been saying recently that they prefer to buy “starts” (young plants) for some of their gardening. And compared to buying a broad bean seed packet I’ll never use up this year, maybe six broad bean plants would save money. It would certainly save time. But give me seeds any day. In gardening I’m all about the miracle, less about the practical. The real world presses in on me, as I’m sure it does on you: this week alone offered me a big dose of unloveliness, including one vomiting bug (mine), then another one (my son’s), the imminent loss of a client (government cutbacks) and the likely sale of the house I grew up in — all against a mustn’t-grumble backdrop of guilt as images of tsunami, war and death scrolled across the TV. I need my gardening to be as absorbing and as miraculous as possible if it’s to be an adequate salve against the real world. Those seed trays may give me beets in June. But right now I see a windowsill full of hope, and that’s the food I need. Yes seeds for me too, it is the joy you get when they poke through the soil and then grow and grow. Great colours on the baby beets. I would say cuttings come a very close second in terms of excitement. It still amazes and delights, when what is basically a stick, becomes a plant of its own. I couldn’t agree with you more about the miracle of growing from seed. I’m sorry to hear you’ve been beset with bugs and various other things. As you say, in comparison to what some are suffering it’s bearable. Oddly, my childhood home is about to be sold as well. I’m returning to Portland, Oregon next week to say goodbye to it. It’s all because of a landslide and my 81-year-old mother, who spent all her life out in the garden, will be leaving it for a new adventure and a new garden. Petra — oh good point. I’ve mixed success with cuttingls, and seed leaves do it for me more than root growth, but I love how fast cuttings grow into big plants. I have 2 nice monarda growing well from cuttings. Christine — I’m unsure whether I’ll do a goodbye. I would rather remember it as I remember it! Still nursing that bug…felt too shaky to do much in the garden today, which on a fine day like this is a tragedy– not a real tragedy, just a pity. Must stop feeling sorry for self! It’s been a lovely day weatherwise, my husband made dinner (including a cheese sauce), and I just tucked my two kids into cosy beds. All is well, really. When world events and/or personal troubles feel overwhelming, I find myself turning to the garden as a source of solace and as a way to ground myself (literally!). I hope you’re feeling better soon. Thanks Jean. Funny, there was an excellent piece in yesterday’s Guardian http://ow.ly/1sfsqm along the same lines. The topic of gardening also animates people, have you noticed? Many more people than I ever expected find gardening to be the great escape. Couldn’t agree more, however there are also times when I’ve either changed my mind last minute and need to plant something else, or I just can’t wait for getting some foliage in there! I only started gardening for the first time in May last year. I started off with wee “plug plants” I bought from the local garden centre, but then I got brave and tried seeds. It was easy enough to start with simple salad leaves but the most satisfying thing I’ve done so far is sow cabbage seeds last August and the cabbages are now ready to eat. When I look at them now I can barely I grew them – me, all myself! From SEEDS! Tiny little seeds! Good point Tim – this year for the first time I’m potting up & keeping ready a bunch of self-seeded plants, and plants I have had to move from someplace else; I’ll have these ready to put here and there when needed! It is amazing that one can grow an entire garden from seed, but full-grown plants are always useful. my husband would love me to grow cabbage, but I need to find ones that don’t take up much space. It’s the one vegetable he’s really wanting me to do! What variety did you sow? It really is incredible that so much comes from that tiny speck. I tried cabbages in the ground last summer but they all fell foul of the dreaded cabbage root fly maggot. So my next attempt was to grow them in Morrisons flower buckets and they did fine. This is a picture I took of them about a week ago: http://flic.kr/p/9voKA1 – and I think they’re probably about ready to eat. The seeds were F1 Advantage and after planting the seedlings out in the buckets last autumn and ringing them with organic slug barrier granules then putting cabbage collars on them, I put some fleece over them to keep the caterpillars away. In the horrible December snows the fleece somehow disappeared but the cabbages just lived on quite happily under the snowdrifts (http://flic.kr/p/8XwxT6), through the frosts, howling gales, you name it. Cabbages in pots. The way to go if space is at a premium, I reckon. Okay, I only grew 8 to start with (and one died), but this year I’ll do double that I think. I’d love to hear if you try it! I couldn’t agree more – I tend to take a cup of tea to the greenhouse and while absorbed in radio 4 do all the seeding for the upcoming season, by the time you are done, you tea is full of compost and all is right with the world. Croila– sorry I wish I knew why the colour change. But you did great to bring them thru that winter. I saw your snow pic…so glad that’s behind us! My pak choi survived, too, am definitely planting more this year. lily bulbs in my cold greenhouse died, probably snow would have protected them. Cat — that made me laugh and laugh, picturing all my cups of tea compost has made its way into. I’ve started eating my lunches in the cold conservatory that’s hosting all my seedlings, because of that feeling of all being right with the world there. Btw this is the first year I’ve sown seeds using vermiculite, and I swear it smells even better in there because of it. 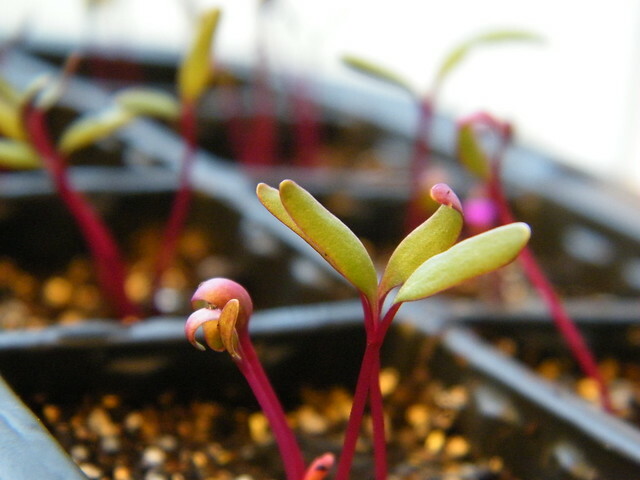 Sowing seeds is he best way to get the younger generation into gardening. My mum started me off with Cress seeds and I’ve never looked back since. Ive got my four year old son on sunflower seeds at the moment I’ve told him how big they grow and he can’t wait.